TransFerrante, the first panel discussion of Meta 2017 was held on the 13 February, 2017, under the Banyan Tree. 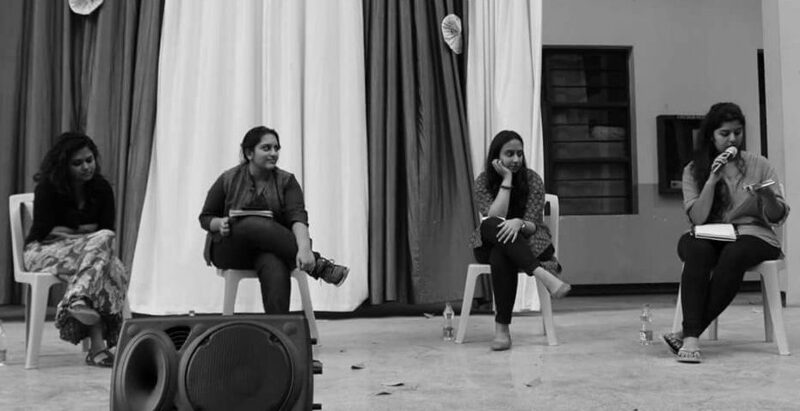 The panelists were Vismaya Vishwa and Drishti Rakhra of III EJP, Prof. Vijeta Kumar of the English Department, and Ila Ananya- an ex-Josephite, currently working at The Ladies Finger. The discussion was on an Italian novelist, Elena Ferrante, who is well known for The Neapolitan series. The discussion started off with a question, raised by Prof. Vijeta. “At what point in the book did you sit up and notice something?” she asked. Drishti said that she was startled before she even started reading the book because she knew how relatable the book was. They spoke about the reasons as to why they could relate to the characters. “Each one of us have had friendships where we’ve loved the person, but have also been jealous of them, and tried to destroy them in the process”, said Vismaya Vishwa. They went on to speak about the ambiguous ending of the novel, the kind that Vismaya Vishwa particularly hates, they also spoke about how much they tried to stalk Ferrante, but remained unsuccessful. Speaking about the male and female characters in the series, Drishti said, “By the end of the series, I didn’t remember any of the male characters.” The panel was then open to questions from the audience. Could they relate to a different character every time a part in the novel startled them, in contrast to the time it happened before? “It should have happened but didn’t because the book is written in such a way that I was more carried away by Elena Ferrante”, answered Prof Vijeta. They were asked if they would be disappointed if they found out that the writer was a man and not a woman. “There is no way that a man could write about women as intensely as this novel portrays them to be. So, it has to be woman”, said Ila Ananya. ← What is the use of Books Without Pictures?